A weak character arc makes this Green Lantern pretty dim. Green Lantern is a big, colorful adventure with loads of action. But it’s the kind of action that lacks energy; most of it is action for ADD’s sake. Midway through this attempt to launch a whole new franchise questions come to mind that have nothing to do with the story itself, but rather bigger concepts, like why were Spider-Man and The Dark Knight so successful? Why does this movie pale in comparison? Why does this movie feel more like a Fantastic Four flick rather than something worthwhile? As the movie careens toward its universe-spanning conclusion, all sorts of revelations begin to answer those questions. The revelations have nothing to do with the characters, though; the revelations weren’t written by the not-so-fantastic four screenwriters. The revelations peel away all the eye candy and get to the heart of Green Lantern’s many problems: It’s a big, brisk bore. And it doesn’t help that the villain looks like something from When Worlds Collide. In this case, the worlds of SpongeBob SquarePants and Mars Attacks! For the record, Green Lantern’s problems have nothing to do with the cast. 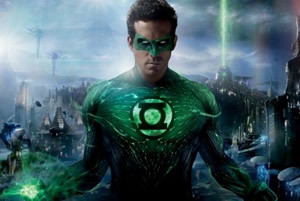 Ryan Reynolds (The Proposal) is as likable as ever and in theory he makes for a credible Hal Jordan. Blake Lively (The Town) pulls off the difficult task of being both smokin’ hot and brainy in the role of ace pilot and business wiz Carol Ferris. For his part, Peter Sarsgaard (Flightplan) is quite entertaining as a stooped, nerdy scientist who gets his jollies from poking at an alien corpse. Throw in the seasoned Tim Robbins (Steven Spielberg’s War of the Worlds) and Mark Strong (Sherlock Holmes) and the cast is a lock. Terrific. Using Spider-Man (well, the first two Sam Raimi flicks) and Christopher Nolan’s Batman movies as yard sticks, it’s easy to see where Green Lantern comes up short. Spidey and Bats feature story arcs that revolve around personal growth. The down-to-earth protagonists, Peter Parker and Bruce Wayne, overcome the loss of loved ones and find ways to harness their powers for good. In the case of Peter, it’s a spider bite that imbues him with unusual abilities. For Bruce, he’s got a big wallet. Then there’s Hal Jordan. He too has suffered loss. When he was a kid, his fighter-pilot father died in an accident. But years later, Hal’s still haunted by that incident and finds himself freezing at a critical moment during a war games dogfight. That’s not unusual for the guy; family and friends think he’s some sort of daredevil with a death wish. Actually, he’s a wonderboy who still needs to overcome fear. Peter and Bruce grow from their adventures; they clearly move from Point A to Point Z. For Hal, well, shucks, it just so happens that his biggest weakness turns out to be his greatest strength. The Green Lantern Corps is all about overcoming fear and conquering evil. So the fact that Hal has an irrepressible fear makes him perfect to don the green. And that’s simply not compelling. Sure, come conclusion time, Hal’s making reparations with his on-again-off-again long-time love, Carol, but he’s the same arrogant punk that, in the movie’s opening frames, wakes up beside a beautiful woman and realizes he’s late for work. “Make yourself at home. There’s water in the tap,” he tells her. The lack of gravitas surrounding Hal Jordan, the absence of a strong back story to make him interesting, fuels the lightweight feel of this flick. It’s the same weightless atmosphere that made the Fantastic Four movies less than fantastic. Curiously, in some respects, particularly in terms of the vibrant visuals and intergalactic settings, Green Lantern has too much old-school, Saturday morning TV inconsequential comic book stylings for its own good. Spider-Man and Batman, cinematically, went off in two different directions. Spidey captured the giddy highs of being a young super hero and Peter inhabited a fanciful New York City. Batman went for a darker sensibility that fulfilled what the truly great comic books and graphic novels do: Nolan’s movies leveraged current events for thematic undertones that further enriched the over-the-top characters and situations. Green Lantern briefly teases of a similar approach when the planet Oa, home to the Guardians of the Green Lantern Corps, is threatened by a Guardian gone bad, a SpongeBob baddie named Parallax. There’s a slight amount of chatter that leans toward 9/11 allusions, but then the movie goes standard Hollywood glossiness and it’s time to reach for the snooze alarm. The members of the Green Lantern Corps have to demonstrate a certain amount of ingenuity; they wear powerful rings that bring to life objects imagined by the wearer. That ability allows Hal to create Matchbox-like road strips to safely land a crashing helicopter. Unfortunately, that ingenuity doesn’t extend to a smarter script. The half-hearted nature of this green endeavor comes to full light when Sinestro (Strong), a purplish-pink-headed Green Lantern, becomes the subject of a post-credits sequel tease. Demonstrating a complete lack of faith in the audience to stick around, that tease comes after the lead credits and before the regular end credits roll. After the final end credits, there’s just a lame advertisement for DC’s Green Lantern comic books. On second thought, maybe the mantra of Hal’s biggest weakness becoming his greatest strength is simply holding up a mirror to real-world Hollywood. It’s a Hollywood that must come to terms with the fact that the huge success of Spider-Man and Batman has turned into Hollywood’s biggest creative liability. (anonymous): "The problem with Green Lantern has nothing to do with the cast"